Dailybuzz.ch: She Boasts Of Supernatural Powers And Plunders Zimbabwe's Diamonds To Buy Designer Shoes. She Boasts Of Supernatural Powers And Plunders Zimbabwe's Diamonds To Buy Designer Shoes. Grace Mugabe has been called many things since the moment when, barely out of her teens, she caught the eye of the president of Zimbabwe as she tapped away in his typing pool. Now his wife, she styles herself ‘Amai’ (mother) for her supporters but, behind her back, is derided as Gucci Grace and The First Shopper, a reflection of her extravagant spending in designer shops around the world despite the struggles of her country. Others simply call her Dis Grace, especially those who believe she forced her 90-year-old husband Robert to remain in power so she could plunder Zimbabwe’s diamond wealth to fund her overseas shopping trips. But now a nervous nation fears she could soon have a new title: President. For this reviled woman has stepped, in her costly Ferragamo shoes, into the political arena, exploding a titanic power struggle to succeed the increasingly doddery despot who has ruled Zimbabwe so disastrously for more than three decades. Many Zimbabweans believe she wants the top job, which would make her the first female dictator in modern history. The 49-year-old has stoked such fears by touring the country by helicopter, holding mass rallies and pouring scorn on her rivals. Most of her fellow citizens see this as a chilling prospect that threatens to plunge their beautiful but tormented country into fresh despair. Grace Mugabe is, quite simply, loathed. ‘She is an avaricious monster with a vindictive nature, who makes Imelda Marcos look mild by comparison,’ one close observer told me. This is a woman who personally threw an elderly white couple off their family farm, punched a British photographer in the face after he snapped her on a shopping spree and claimed to have cursed a South African critic of her husband who committed suicide. Diplomats believe she is stealing vast chunks of the nation’s wealth from diamond mines. She blew £3million of state funds on her daughter’s wedding earlier this year and defends wearing her Italian designer shoes while people starve on the basis that she has ‘narrow feet’. Suddenly the public buses in Harare are bearing huge images of her hated face. She has been given a doctorate in sociology after a two months of supposed study and ministers are gushing about the ‘guidance and leadership’ of a woman ‘who is a mother to us all’. On Thursday night, she and her shadowy allies showed their strength by purging key opponents from the ruling Zanu-PF party at a marathon late-night politburo meeting. Among them was Jabulani Sibanda, leader of the feared war veterans who oversaw the brutal campaign to seize white-owned farms. Sibanda had publicly refused to attend Mrs Mugabe’s rallies and said veterans would not tolerate ‘a bedroom coup’. Also expelled were Rugare Gumbo, official party spokesman, and several provincial party chairmen, all accused of plotting to oust Mugabe. The president was reported to have angrily confronted Gumbo at the meeting after the Zanu-PF veteran told state television it was time to end the debate over succession. And this is the question at the heart of the power struggle: who will take over from the cold, calculating man who has clung on to power in Zimbabwe since it won independence from Britain in 1980, overseeing the slaughter of rivals, the shocking collapse of the economy and the shameful theft of its mineral wealth? The country has long been transfixed by a battle between two powerful rivals who loathe each other. On one side is sinister justice minister Emmerson Mnangagwa, a former spy chief nicknamed The Crocodile, who is thought to represent party hardliners and own substantial gold and diamond mining interests. The other camp is led by Joice Mujuru, vice president since 2004 and a liberation struggle veteran who fought under the nom de guerre Teurai Ropa (‘Spill Blood’ in the native Shona language). Her husband was a former army chief killed in a strange fire at his seized farmhouse three years ago, despite police guards. His estate was rumoured to be worth £7 billion. Their clash boiled over three months ago when Mrs Mugabe was nominated as leader of the Zanu-PF Women’s League, a powerful politburo role. During a ten-rally tour of the country, the first lady tore into Mujuru in the most vitriolic terms, calling her ‘corrupt’ and ‘a liar’ needing exposure. She speculated the 59-year-old might be killed, adding ‘dogs and fleas would not disturb her carcass’. Her jibes were supported by screaming headlines in official newspapers, one accusing Mujuru of conspiring with the CIA to depose the president at next month’s congress. The vice-president has stayed silent. Meanwhile there was a spate of suspicious deaths and severe injuries to senior regime officials, while businesses say they are being forced to take sides, with potentially dire consequences if they make the wrong choice. 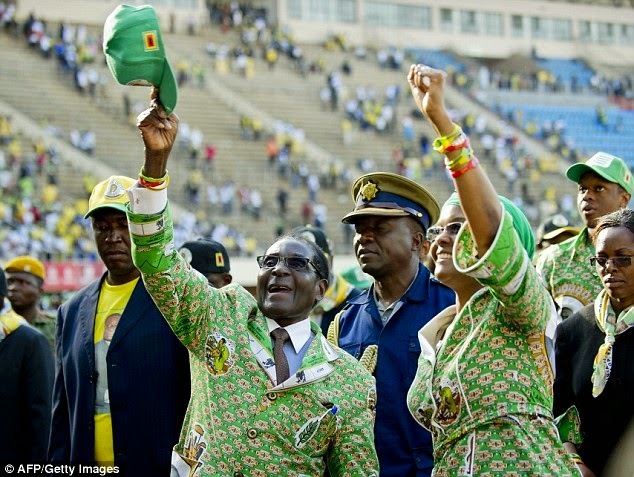 No one is quite sure whether Mrs Mugabe has allied with Mnangagwa to protect the huge family assets and ensure she is not arrested after her husband’s death – or is plotting with the president to succeed him and establish a Mugabe dynasty. Certainly the dynasty was on display in March for Mugabe’s oldest daughter’s flashy wedding, when champagne flowed as famous African musicians performed for 4,000 guests, including several heads of states and many of Zimbabwe’s most powerful figures. The 24-year-old bride wore a jewel-encrusted gown as she was given away by her father, resplendent in tuxedo and bow tie. The mysterious groom – said to be an intelligence operative – wore a sparkling silver jacket. 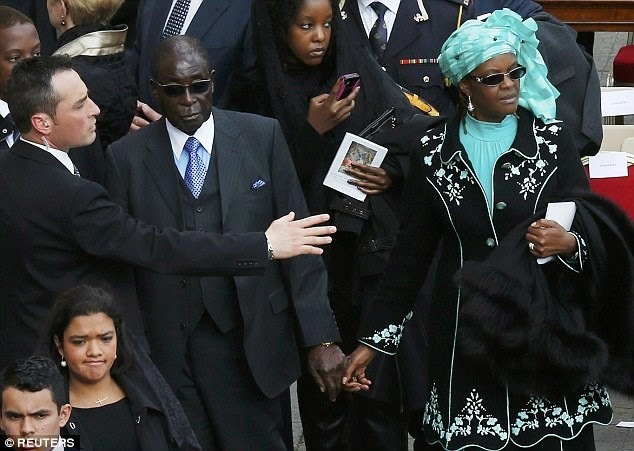 Presiding over it all as she glided around the gardens of Graceland – the family’s Harare mansion that is reputed to be one of the largest houses in sub-Saharan Africa – was the mother of the bride, her chunky silver earrings and impressive rings glinting in the sun. 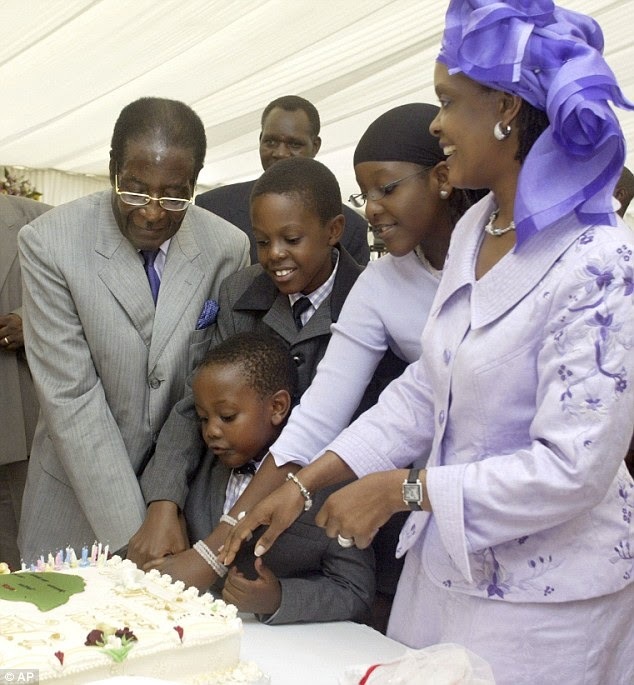 Just days earlier Mugabe celebrated his 90th birthday, cutting a cake in front of cheering crowds crammed into a stadium for a barbecue said to cost more than half a million pounds, despite the country’s continuing cash crisis and crippling unemployment. The previous year, special gold coins were minted to mark the occasion. If Mugabe’s wife were to inherit his throne it would be a remarkable rise to power for the former secretary, who began an affair with the president as his popular first wife Sally lay dying of cancer. Their only child died aged three of cerebral malaria. ‘It might have appeared to some as cruel,’ Mugabe said last year. ‘My mother has all the time said: “Ah, am I going to die without seeing grandchildren?” So I decided to make love to her [Grace].’ They married in 1996. Even before their marriage, Grace was accused of using state funds meant for low-cost housing to build a huge mansion in Harare. When the High Court ruled her loans were illegal she sold the property to the Libyan government, kept the proceeds and built an even bigger place. Twelve years ago she turned up with armed enforcers at the home of a septuagenarian couple who owned a stunning 2,500-acre estate. ‘I’m taking over this farm,’ she told them, warning they had 48 hours to leave or face arrest. Since then Grace has built up a farming empire of thousands more acres of prime agricultural land, and launched a dairy range. ‘If she wants something, she just tells people she is taking it,’ said one diplomatic source. Last year, she claimed she had to expand a small orphanage near Harare and took 4,000 acres of a company-owned estate, leaving 50 families homeless and costing the firm nearly £4 million. She added another 2,100 acres this year, claiming to have found the land lying idle. Local sources say she wants further expansion. Public distaste over her profligate spending grew as the economy slid into crisis after the farm seizures. She spent hefty sums on shopping trips in London, Paris and Singapore, where she was photographed with 15 trolleys overflowing with luggage at the airport. The Mugabes make regular visits to Singapore, where the president receives treatment for rumoured prostrate cancer while his wife hits the shops. She is renowned for her fiery temper, most infamously displayed five years ago. As her nation was ripped apart by the second worst hyper-inflation in history, she was seen on a shopping spree in Hong Kong by British photographer Richard Jones and responded by attacking him. ‘She was completely deranged,’ said Mr Jones afterwards. His face was cut by her diamond rings after she hit him several times. She claimed diplomatic immunity to escape charges. A legal battle earlier this year appeared to confirm reports the Mugabes had bought a £4 million luxury bolt-hole in Hong Kong. Funding for these homes, her colourful designer clothes and accessories such as Cavalli sunglasses, comes from the fabled Marange diamond mines in eastern Zimbabwe. Few profits dribble through to the state, which struggles to pay public sector salaries. The WikiLeaks website revealed a former US ambassador identified her among a small group of high-ranking officials ‘extracting tremendous diamond profits’ from these mines. Zimbabwe’s stolen diamonds are sold through a Hong Kong dealer and the proceeds often spent on arms. I have seen recent internal state documents tracking regular consignments worth tens of millions of pounds through Angola and Dubai. Such is the suspicion and infighting over this plunder that, even within the security forces, the rival camps spy on each other all the time. Zimbabwe is now waiting and watching for its first lady’s next move. ‘This is clearly a political power play motivated primarily by the Mugabes’ desire to hold on to the massive amounts of personal wealth they’ve accumulated in power,’ said Jeffrey Smith, a Washington-based analyst. Grace even seems to believe she has supernatural powers now. Referring to the death of Heidi Holland, author of an acclaimed book about Mugabe, she told one rally: ‘There was a white lady who wrote a book castigating President Robert Mugabe. The big question is whether this despised woman can survive the deadly bear pit of Zanu-PF politics – or if she is she just a pawn being used by other powerful players. ‘She is portrayed as a smart businesswoman but everything she presides over is looted – although she is certainly an expert at retail therapy,’ said one authoritative source. Only time will tell if such gruesome fate awaits Grace Mugabe. Or whether she ends up as the modern world’s first female dictator, an alarming prospect for a land that has suffered so much and for so long under her husband.